On Sunday, tennis fans around the world will tune in to focus on Paris for the French Open, tennis' 2nd Grand Slam of the year. The year consists of 4 Grand Slam tournaments played on three different surfaces: Australian Open (Hard), French Open (Clay), Wimbledon (Grass) and the U.S. Open (Hard) where men and women compete for tennis' biggest prizes on their biggest stages. While most of will watch a match from one of these tournaments at some point in our lives, not many of us are aware of the deep history of some of these tournaments and today, we will focus on the history of the French Open. The French Open is also referred to as "Roland Garros", the name of the famous French World War I aviator and the name of the facility where the tournament takes place (Stade Roland Garros). It is played on "red clay" (red brick dust) but the interesting fact is that the "clay" isn't really clay but is white limestone that is 3 inches thick that is then covered with the red brick dust then watered down to create a coat that gives the clay the look it has. 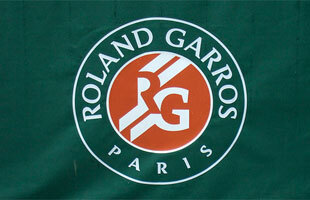 The tournament began in 1891 as a national amateur men's tournament for players who belonged to a French tennis club. The original name of the tournament was Championnat de France or The French Championships. The ironic thing is the first winner, H. Briggs, was a Brit but a Paris resident. Women were added to the championships in 1897 and the tournament continued to develop and by 1907, had categories similar to a current tennis tournament format (Men's Singles/Doubles, Women's Singles/Doubles and Mixed Doubles). In 1925, the French Open was open to international amateur players and was recognized as a Grand Slam tournament for the first time. Ana Ivanovic, French Open final, 2008. Although we are used to the French being the 2nd Grand Slam and Wimbledon being the 3rd Grand Slam, in 1946 and 1947, they swapped places, making Wimbledon 2nd and the French 3rd. The French Open was also the 1st Grand Slam tournament to take the leap of making the tournament "open" or allowing both professionals and amateurs to compete for the same title. While the French Open was held in a number of facilities between 1891 and 1927, in 1928, the current Stade Roland Garros facility was built on 21 acres of land. While Wimbledon is regularly praised for their tradition and long-standing history, the French Open was willing to take risks that other tournaments did not. Time and time again, the French Open made changes that changed modern-day tennis that has barely been recognized. When you tune in during the tournament next week or next time you play, think about how some of the advantages tennis players have now were started at the French Open.